I’ll be continually adding concepts here, while also letting everyone add their own. If I make any concepts that are similar/identical to yours, it’s most likely a coincidence, and I send my apologies. •Basic Attack: Lumiere throws a dash of flame from his hand at an enemy. •White, Candlelit Dinner: Lumiere puts his candles in front of his mouth and blows on it, showering the frontline enemies with flames. This deals X damage and causes fire damage over six seconds. Normal Damage. •Green, Enchanted Light: Lumiere brightens the flames on his head and hands, removing debuffs from nearby allies. •Blue, Ask the Dishes: A group of enchanted plates, forks, and knives runs across the battlefield, damaging all enemies. This attack does 15% more damage for every 10% health the enemy is missing. Normal Damage. •Purple, Be Our Guest: Lumiere’s Green and Blue Skills, as well as his basic attacks, heal his weakest ally for 10% of their Max HP. Has a chance to fail on allies above level X. 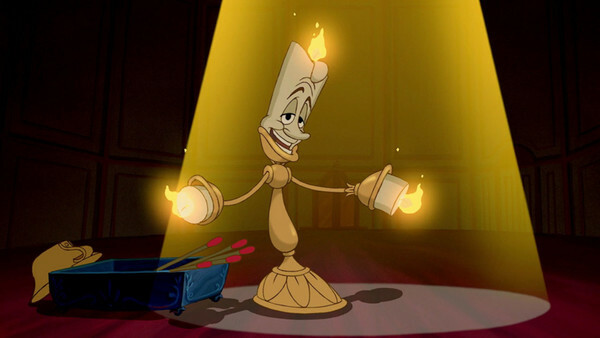 •Entrance: Lumiere hops onto the frontlines, rubbing his candles together as if excited for the battle. •Victory: Lumiere spins and throws his candles up, cheering. •KO: The flames on Lumiere’s candles suddenly extinguish, leaving Lumiere with a sad look as he hangs his head. -Minor Bonus: +X Max HP, +Y Health Gain when ally uses their white skill. -Disk Ability: Gains More Resources. Lumiere gains 50 energy whenever an ally uses their white skill. +50 energy per star. -Description: Mickey is troubled to see various heroes tired and borderline depressed on account of constant battling the creeps. Meeting Lumiere, the two put together their flashy entertaining abilities to put on a show for their allies and raise morale. -Minor Bonus: +X Basic Damage. -Disk Ability: White Skill Freezes. “Candlelit Dinner” has a 50% chance to freeze enemies for 2 seconds. After freezing ends, enemies take 15% of their Max HP as True Damage when they are hit with a damaging white skill. +1 second per star. -Description: Lumiere and Beast finish fighting off a clan of creeps in an alley. 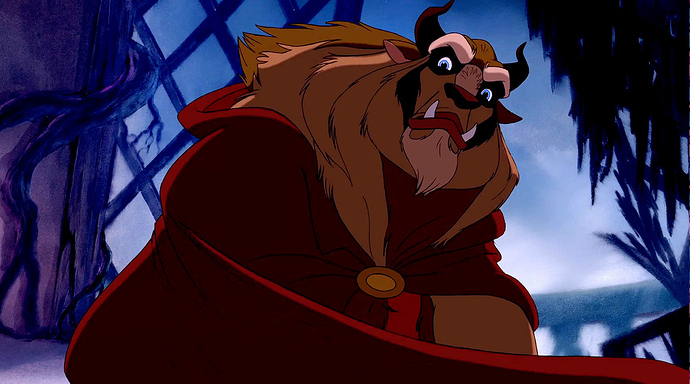 The Beast offers Lumiere to go back to “HQ” with him, but Lumiere, hoping to find some time for a walk, declines. Walking past the park, Lumiere spots Olaf being harassed by a creep. He and Olaf fight it off, Lumiere nearly melting Olaf in the process. The two go on patrol, getting to know each other while Lumiere tries not to melt him. About to make attempt at Beast. Beast is personally one of my favorite male Disney characters, so I’ll try to do him justice. •Basic Attack: Beast slashes and roars at an enemy to attack them, similarly to how he attacks the wolves in the forest. •White, Hear Him Roar, See Him Foam: Beast gives a terrifying, defeaning roar, scaring all enemies for eight seconds and stunning for two seconds, while also dealing X Damage. Fantastic Damage. The disables may have a chance to only apply for two seconds (Scare) and .5 second (Stun) if the enemy is above Level Y. •Green, Charging Blow: Beast headbutts the enemy team, dealing X Damage. Fantastic. •Blue, Brute Strength: Beast negates all damage from the next attack he receives, while gaining X Basic Damage for the rest of the wave. This attack can only occur once every seven seconds. •Purple, Tale as Old As Time: Beast heals for 10% of his Max HP when an ally uses their white skill. Has a chance to fail if the ally is above Level Y. °Minor Bonus: +X Max HP, +X Skill Power. °Disk Ability: Cleanses Debuffs. Beast is invincible for the first three seconds of combat. “Charging Blow” unloads ally debuffs onto enemies. +1 seconds per star. °Minor Bonus: +X Basic Damage. °Disk Ability: When the Beast falls below 75%, 50%, and 25% HP Checkpoints, he grants allies a shield equal to 10% of their Max HP. +10% per star. This was a bit difficult, not going to lie. I vaguely remember drafting a concept for Jafar, but I did not post it on the forums. So, I think I’ll fill in some of my time tonight with posting a heavily edited Jafar concept. The former advisor to the Sultan of Agrabah, Jafar vanquishes enemies with his powerful sorcery. Basic Attack: Jafar shares a unique ability with Jack, that being his basic attack deals Fantastic Damage. His basic also removes Reality from targets. Their Reality returns to it’s original amount if Jafar is killed in battle. 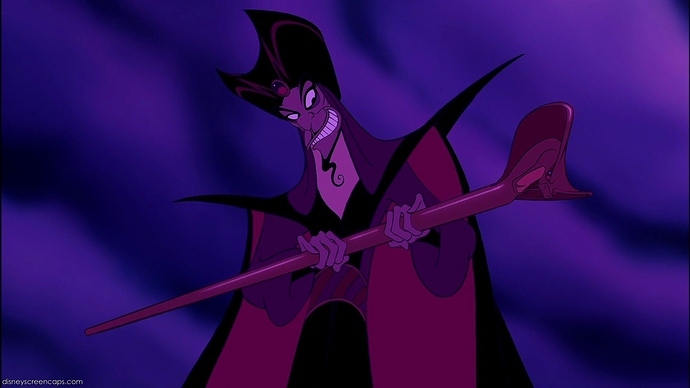 Jafar tases an enemy with the same red energy from his staff seen in the film. •White, Cower Before A Sorcerer: Jafar lifts and swirls his staff (in a motion similar to Maleficent’s “Forest of Thorns” skill,) and is surrounded by red mist. A larger blast of red magic strikes an enemy, dealing X damage and Cursing them for eight seconds. Jafar also gains X HP. Fantastic Damage. •Green, Punishment Fits the Crime: Whenever any enemy gives a debuff to any of Jafar’s allies, Jafar does 2% more damage to that enemy. Higher damage will not be added to enemies over Level Y. •Blue, Just Getting Warmed Up: When Jafar reaches 33% HP, he becomes a snake and breathes fire on enemies, dealing X damage and causing burn damage over six seconds. Fantastic Damage. •Purple, Grand Vizier: Any shields Jafar is given multiply their health 2x, and Jafar gains immunity to Stuns. Jafar cannot avoid stuns from enemies above Level Y. °Disk Ability: “Just Getting Warmed Up” triggers infinitely. In addition to 33%, Jafar becomes a snake at 65% HP. Jafar’s skill triggers again if he crosses the checkpoint again after health increases (Ex. If Jafar triggers his blue skill after being taken from 40% health to 20% health, say Miguel healed Jafar back to 100%. Jafar’s skill triggers again if he crosses the 65 and 33% marks, even if they have previously triggered his skill.) +5% added to 65% per star. °Description: Jafar meets Maleficent, as the two travel the city, while they both discuss their knowledge of dark magic and sorcery. °Minor Bonus: +X Skill Power. °Disk Ability: Each Control ally on Jafar’s team decreases the amount of seconds that debuffs affect Jafar and his allies. Each Control ally decreases the length of disables such as stuns and charms by -.75 seconds. -.75 seconds per star. °Description: Jafar secretly plans to lead a hidden militia of heroes, and he begins looking for a figure to serve as a field general for his group. On hearing that Gaston is a highly respected warrior and veteran, the two hold a meeting to make a deal. Afterwards, the two patrol the city, surveying the area and fighting creeps. Just because I feel like I’m on a roll, I’m going to make a quick concept which I’m almost certain will not make it to the game. But hey, it’s all fun and games. Zeus is a backline damage hero, who leaves enemies shaking in their boots from seeing his godly abilities. Basic Attack: Zeus throws a lightning bolt at the closest enemy, damaging them and stunning them for one second. •White, Lightning Strike: Zeus strikes an enemy with his signature lightning bolt, dealing X damage, removing any positive effects and instantly destroying any shields equipped. Fantastic Damage. •Green, Blinding Power: Zeus holds his lightning bolt high in the air, blinding all enemies in front of him for four seconds and raising all allies Basic Damage by X. 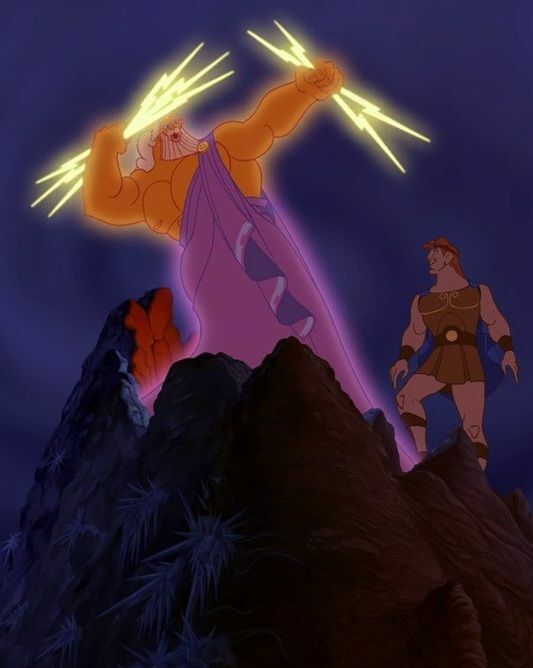 •Blue, Gone, Babe: Zeus summons the messenger god (I can’t remember if it’s Hermes or Aires in the original film. All I remember is that he has a blue color scheme, with a winged staff.) Hermes/Aires flies across the screen, stunning all enemies for three seconds and granting Zeus a 50% attack speed increase. •Purple, Olympus Royalty: If a stunned enemy is stunned again, Zeus and his allies gain X HP. Beasts white skill is too similar to jack skelly. It’s Jack’s white but longer scare and added damage. Maybe replace the stun with a silence. I love ur Zeus. Maybe add a small splash radius to his white skill, but the splash only does the damage, not the additional effects. Also I’m not sure about stunning basic attacks, that seems pretty op as it would make it nearly impossible for a frontline enemy to get any sort of skill off. And now, a concept for a character who is practically my number-one favorite in terms of being a goofball. Ladies and gentlemen: Kronk. 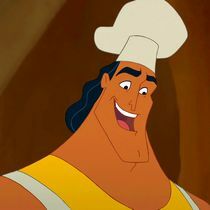 Appearance: Kronk wears his regular clothing seen in The Emperor’s New Groove, only as a chef, gifting him with an apron and a toque. Basic Attack: Kronk smacks an enemy on the head with a cooking tray. •White, My Spinach Puffs! : Kronk tosses a tray/bowl of spinach puffs, dealing X Damage to all ememies and tosses some spinach puffs backward to his allies, healing them for Y HP. Fantastic Damage. •Green, Cast-Iron Clash: Kronk throws his frying pan at a random enemy, dealing X Damage and stunning for three seconds. Fantastic Damage. •Blue, Path of Righteousness: Kronk’s angel and devil appear on his shoulder. If Kronk is below 50% HP, his angel plays his harp, healing Kronk for X HP. If he is above 50% HP, Kronk’s devil will shoot a small fireball out of his trident, dealing splash damage to all enemies and causing burn damage over six seconds to the main target. Fantastic Damage. •Purple, Master Chef: Kronk gains X Max HP and Y Basic Damage. °Minor Bonus: +X Max HP and Y Shield HP. °Disk Ability: “My Spinach Puffs!” gives allies a shield for Y HP for 10 seconds. Shield also has a 75% chance to stop debuffs. +2 seconds per star. °Disk Ability: Basic Attack does Fantastic Damage. Any enemies that disable Kronk take 10% of their Max HP as Fantastic Damage. +5% per star. As some of you have probably seen, I changed the name of the title of this particular post to a creativity post. So now, we technically have the freedom to get creative with characters that will most likely or cannot be added. That being said, I’m going to make a concept for a character that has already been denied, but is still one of the most iconic and sinister villains in not just Disney, but in film history itself. Ladies and gents . . . Darth Vader. Basic Attack: Vader slashes an enemy with a swipe of his lightsaber. •White, Power of the Dark Side: Vader raises his hand to harness the Force. A large boulder of metallic debris smashes down from the air onto the enemies, dealing X damage to all enemies and stunning them for two seconds. Stun may fail against enemies above Level Y. Fantastic Damage. 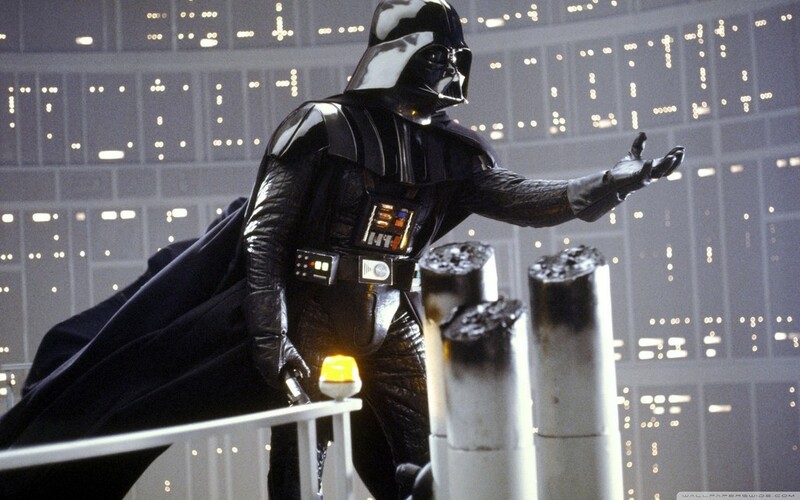 •Green, Force Choke: Vader raises his hand to strangle an enemy with the Force, stunning the enemy for five seconds and Scaring all enemies for eight seconds. Vader cannot scare enemies above Level X. •Blue, Life Support: The first time Vader reaches 0 HP, he revives himself for X HP, and gains Y Skill Power. •Purple, Sith Warrior: Vader enhances his combat abilities, making him deal X extra damage to stunned and Scared enemies, as well as enemies under 50% HP. °Minor Bonus: +X HP healed by blue skill. °Disk Ability: “Force Choke” now deals 5% of the enemy’s Max HP as True Damage per second. +2 seconds Force Choke duration per star. °Disk Ability: Vader’s Basic attacks slow enemies attack speed by 15% for three seconds. This handicap resets at 100% slower. +20% slow cap per star. Entrance: Vader walks onto the battlefield, breathing heavily as he activates his lightsaber. Victory: Vader puts away his saber in his belt, staring silently forward. KO: Vaders lightsaber automatically deactivates, as Vader drops it, falling to his knees, then falling down completely. This one’s a biggie. One of the most iconic and successful comedy relief characters in Disney. If I end up screwing up this concept, which I most likely will, please give out some feedback so I can edit out my silly mistakes. Basic Attack: Edna throws a small gadget which she uses to craft suits at an enemy. Possible objects could include scissors, small pocket laser, ruler, etc. etc. •White, 1000 Degrees! 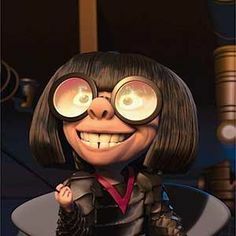 : Edna Mode activates a turret to fire out of the top of the screen, blasting the enemy team with fire, dealing X Damage and causing burn damage over six seconds. Normal Damage. •Green, Old Ideas, New Use: Edna chucks a trash bin full of crumpled papers, failed design concepts, at the frontlines, damaging them and slowing their attack speed by 75% for five seconds. •Blue, Clothing Structure: Edna studies a set of blueprints for a supersuit, making her invincible for four seconds. •Purple, No Capes! : Edna becomes immune to Stuns, Freezes, or any other disables that affect her speed or movement. Entrance: Edna rolls onto the battlefield in the mobile seating area that she and Elastigirl sat in while Edna showcased the Incredibles suits to Elastigirl. Edna hops off and gets into position, while the railed seats disappear. Victory: Edna takes out her clipboard and happily checks off an item. Defeat: Edna takes out a blueprint and crumples it up, throwing it on the ground as she stomps her foot. Passively, Each of Dr. Facilier attacks heal him 50% of damage done. Actively, Dr. Facilier bites a enemy with his voodoo necklace stunning it for 4 seconds and cursing it for 6 seconds deals true damage. Facilier shows an enemy it’s future hexing it for 6 seconds dealing normal damage. Facilier’s shadow grabs the farthest enemy and pulls it closer to him scaring other enemies for 6 seconds dealing fantastic damage. Facilier’s blue skill and basic attack now deals critical damage if he is below 50% hp. The green skill is kind of useless. The whole point of Hexed is to keep enemies from using their white skill, but Stunned forces them to not use it, so you’d only be “Hexing” them for two seconds. Kind of useless in that sense. Noticing that some players want Cars characters to be added. Sounds like a challenge. Lightning McQueen tears up enemies on the battlefield with his unrivaled driving and racing skills. Basic Attack: Lightning strikes an by driving forward, then pulls back. •White, Faster Than Fast: Lightning drives at full speed through the battlefield, dealing X Damage to all enemies that he hits, and healing McQueen for Y HP. Normal Damage. •Green, Float Like a Cadillac: McQueen revvs his engine loudly, damaging enemies for X and giving McQueen Y Basic Damage for the wave. Normal Damage. 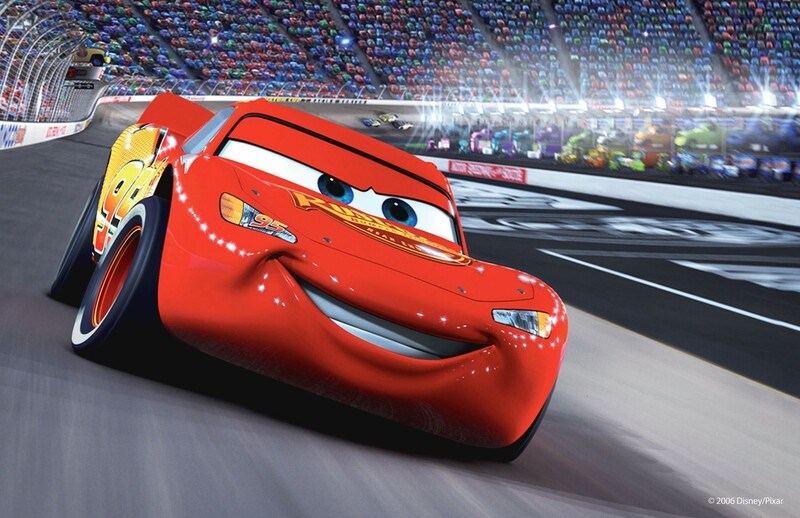 •Blue, “Ka-Chow!”: McQueen flashes his reflective sticker at the enemies, stunning frontline enemies for four seconds and damaging them for X. Normal Damage. •Purple, Pit-Stop: When McQueen reaches 20% HP, Lightning becomes invincible for three seconds. He then regenerates for 50% of his Max HP and 300 Energy over five seconds. McQueen can use this skill up to three times at any point in the battle. °Minor Bonus: +X HP healed by white skill. °Disk Bonus: McQueen’s Basic Attacks and White Skill inflicts fire damage enemies over seven seconds. +1 second per star. °Minor Bonus: +X Max HP. °Disk Ability: “Pit-Stop” Stuns enemies for five seconds. Purple Skill activates +1 time per star. Entrance: McQueen drives up to the frontlines, screeching to a stop with turned tires, grinning. Victory: McQueen drives a 360°, then flashing his sticker, smiling at the now-defeated enemies. KO: Lightning’s back tire pops/explodes. He sputters to a stop, slamming the ground with his tire in frustration. A loyal friend equipped with a rickety tow hook, Mater can do some serious damage to creeps. 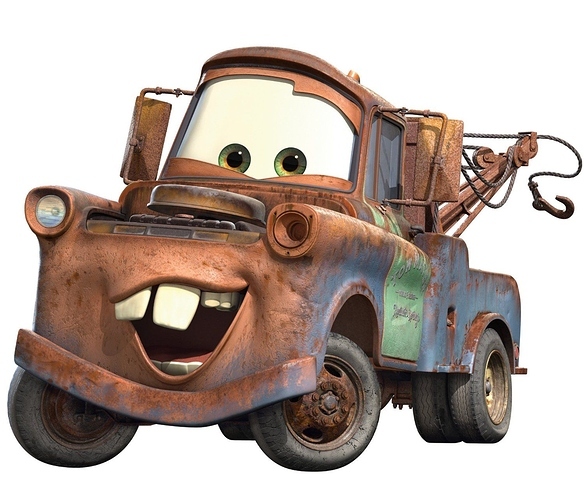 Basic Attack: Mater swings his tow hook like a lasso, whipping an enemy to deal damage. •White, Tractor Stampede: Mater blows his horn loudly, calling a herd of tractors/cows to barrel through the enemies, dealing X Damage and stunning for five seconds. This also increases ally attack speed by 100% for four seconds. Fantastic Damage. •Green, Retractable Hook: Mater lassos an enemy with his tow, pulling them toward him and damaging them. Normal Damage. •Blue, Aw, Shoot! : Mater activates two machine guns (Given to him by Finn and Holly in Cars 2, in case some of you thought I had completely lost my mind. ), blasting the enemy team with bullets, dealing X Damage. Fantastic Damage. •Purple, Git-Er-Done! : “Retractable Hook” deals 100% more damage to enemies over 50% HP. True Damage. °Disk Ability: “Aw, Shoot!” gives Mater 25 energy per second over 10 seconds. +1 seconds per star. Now, I realized that Mater has multiple options for a decent alternative costume. This is my first time setting up a poll, so bear with me. No, he just looks like a vampire.